Do you ever make a pot of coffee in the morning, go to the fridge to get the milk, and Oh, man, no more milk? Or when you're fixing cereal for the kiddos before school? Or when you get home late from vacation? Or you're cooking something? Before my milk emergency (an emergency because I do not drink coffee without milk), I buy a couple of those little cartons of regular milk and stick them in the freezer. When my coffee emergency happens, I run to the fridge. It is important to get small cartons, because it takes a lot longer to defrost the big cartons. You could also just freeze milk in some small containers. Easy Peasy. 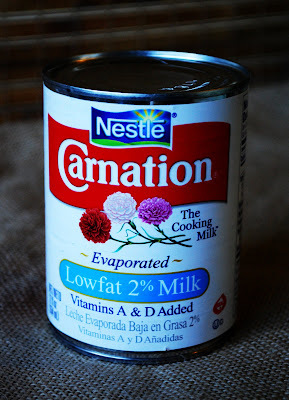 I also buy a couple cans of Carnation Evaporated Milk. It's milk for cooking. It doesn't need a fridge. It's there when you need it. Just a little bit of planning is all it takes. 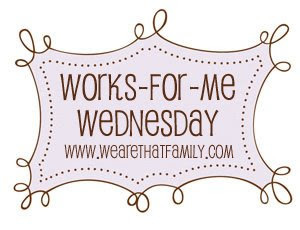 For more tips, stop by We are THAT Family for What Works for Me Wednesday. One more thing ... any American Idol fans out there? Did you watch last night? I really wish they would stop making them sing the generic one-size-doesn't-fit-all song as the last song of every season. The songs are lame. They never sound good. It's insanely anti-climactic. So what do you think? Who are you votin' for? My vote is for Kris. Adam is talented and was my favorite for a while. But at some point, I felt like he was the same every week. Kris gets better every single week. I look forward to seeing what he does. We'll see tonight! Great idea! Actually in our family, we don't drink much milk at all which leads to grabbing the milk and finding that it's spoiled. On morning cereal rush it's not a pleasant thing to find! So I will add "small carton of milk" to this week's grocery list! Having a milk emergency right now! Thanks for the tips and the reminder that I have evaporated milk and powdered milk in my pantry! We must live in the same house...hate coffee without milk, I'll definitely follow your tips!! When I have a milk emergency I use powdered milk...it keeps for, like, a decade! : ) Not really, but it's good to just have on the shelf. And if I don't tell anyone it's the powdered stuff, normally they can't tell, especially in cereal. Aren't I the sneaky one? You are a genius with that milk thing! Nothing bugs me more than making a pot of coffee and not having enough milk...almost as serious of an emergency as broken blow dryer, which happened this morning. You have the BEST stuff on this blog! I wrote this tip down from your comment last week! Thank you for helping me out in the future... cause I know it'll happen again! I'll be ready! P.s. I was rooting for Kris Allen too yea for his win!! 2009 is proving to be the year that makers of affluence fake watch amount out a new way to acquaint their articles and "a la iPhone" seems to be the area of choice.Bell & Ross, Breitling, Piaget and Jaeger-LeCoultre accept all appear out with their own iPhone applications, anniversary alms added beat appearance than the last.